Spring Nail Trends – New Collections! The latest from Zoya is the Lovely Collection that houses 6 pastel shades. Five of these colors are bright hues, all but Jacqueline which is a creamy, vanilla neutral. The 2 colors that have been selling the most for us have been Blu and GeiGei. I think if you like soft pink tones, GeiGei will be a new favorite. This pink goes on light, soft and shimmery, and is extremely flattering on the nail. Easter is coming up, find a light hue for that Sunday best! 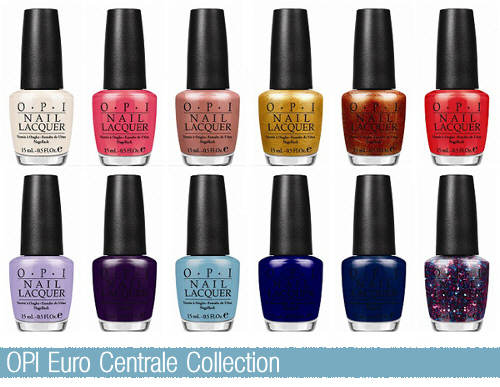 OPI Loves to launch new collections in increments of 12. We don’t mind, it gives us more colors to chose from! Big hits from the OPI Euro Centrale Collection are Polka.com, which is not a surprise with the glitter craze still in full swing. My Paprika is Hotter Than Yours as well as A Woman’s Praguative have been popular sellers as well. The bronze colors seem to always take off, regardless of the collection. These bold shades are great “pops” of color when wearing simple solids. If you read our second to latest blog, you can see where OPI got their inspiration from for this collection! The Zoya Pixie Dust Collection is a glittery and sandy matte polish with a 3D effect. This collection has been overwhelmingly popular! The best seller has been Godiva. This shadeh as been popular because it is a neutral and the most wearable color in the collection. It goes on evenly, and dries with a slight subtle shimmer. A nice every day polish. If you like matte polishes, this collection is definitely something new. The Essie Madison Ave-Hue collection contains very wearable colors, we know these shades will be a huge hit! The gray and creamy undertones make these colors attractive and modern. One thing we know Essie gets right every time, their reds! They go on easily, and Essie offers reds that people find appealing and usually in shades that always seem to be slightly different than the rest! Whether you like bolds, pastels, or neutrals, a fun new polish a great way to spice up an outfit. Find your collection and bring some warm and color back into your nails! Valentines Day is here again, but this year, we’re not going to make the mistakes of last year. No more getting your wife a humidifier, long under wear, or socks. Surprise her with a gift you know she will love. Sometimes it’s hard to find time for yourself with work and other daily responsibilities so we think it would be a wonderful thing to offer your Valentine the gift of “me time”. By giving her bath salts or bubble bath you’re telling her, relax and don’t you dare feel guilty! All women have those days they just feel “blah” and not put together. We can all admit that when we get a hair cut, a manicure or new clothes, we feel renewed. Pamper your Valentine and gift her any one of Zoya’s many beautiful nail polish collections. What a fun way to give a gift of luxury. Let your gal paint her fingers and her toes and give her an array of colors to chose from! Have you heard of Kai? You may recognize Kai from the many magazines it has been featured in, Kai has also been on Opra’s favorite list! All Kai products are lightly scented with the signature scent, white gardenia. Kai sells an array of products for woman ranging from body wash, shampoo & conditioner, perfume, linen spray, etc… Check out Kai | Click Here. Women love a man who can cook, or in this instance, offer up a delicious home made sundae! Have you heard of Serendipity3? This is a famous and most delicious restaurant in New York City, and they serve a to die for hot fudge sundae! They have packaged their recipe for the perfect at home frozen hot chocolate sundae! Now all you need is the movie! A major misconception about this holiday is, that it is just for woman, and that is simply not true! Men deserve to feel special too! A great gift for the man in your life is the LUXO Oporto Soap Gift set. He can use them at the gym, at home, on trips, they will make him smell exceptionally good! With 3 great scents to chose from, he can mix it up any way he wants! Generally, and this is not always the case, but most men need help when shopping for hygiene items. They need us ladies to tell them what looks good on them and what smells good on them! Kama Sutra products offer a wide variety of items that can enhance the intimacy between loving couples. The Kama Sutra Lovers Edible Body Paint is a fun way to explore your playful side! This item comes in Dark Chocolate Raspberry, Milk Chocolate and Rich Caramel. We don’t think that Valentines day should break the bank, we offer a wide variety of price ranges for any budget! Fresh for Spring 2013, Zoya Pixie Dust Collection! Zoya wins us over with yet another fantastic collection fresh for Spring 2013. Textured nail polishes have been very popular this season, with newly released collections such as the OPI Sand Collection, inspired by Mariah Carey. It’s no wonder that Zoya followed suit with their new fun and flirty textured, glittery matte polish! We noticed that this collection has 3 light shades and 3 darker bolder colors, and we love this! It allows for evening and day transitions. We think Dhalia would be a great toe shade, and Godiva would make for a great classy wear, to lets say work or an evening out with the girls! This polish applies thick and evenly for smooth application. This collection dries to look like a nail wrap, which is neat. Our employees and employees kids have tried this polish, and it wears exceptionally well. These shades stay on the nail and don’t have a tenancy to chip, which is ideal for someone with an active life style. Shop our collection now. We are taking pre-orders, packages will ship beginning of February. Zoya’s Gilty Pleasures Trio truly is just that – a guilty pleasure! The bottle of Gilty polish is a topcoat made of 18K gold flakes! Raven and Purity also come in this gift box and are perfect base colors beneath the gold flakes. We sampled each color and tried the gold-flake topcoat alone too. Whether it is worn alone or over another polish, the gold flakes dry flat on the nail and add a touch of class to any color!! The black Raven polish creates a boldness under the Gilty gold-flake topcoat, while the white Purity polish generates sophistication and class. Wearing Gilty on its own also makes a statement of glitz and glam! The gift set also includes a booklet with color combination suggestions. Several celebrities have been spotted wearing gold polish, including Rihanna at this year’s Grammy Awards. Be sure to act quickly to get this set….they are in limited supplies, and are sure to be one of this holiday season’s hottest trends! Gilty Pleasures Trio & Delux Zoya Logo Gift Box: $35 | Start shopping! Zoya Designer and Diva Collection! Finally Here! Zoya introduces 2 new smashing fall Collections! The Designer Collection & Diva Collection! Reds, blue greens and dark purples are trending right now. You will see a lot of these shades in accessories and clothes this fall. We love the sparkle shades from the Diva Collection, great for layering on top of the solid colors for a little more bling! All of these new colors wear well with work attire in addition to transitioning perfectly with an evening wardrobe. Throw on your spiked black stilettos, your leather jacket and find someone with a motorcycle, because once the clock hand strikes, work is so over! Ask yourself. Are you a designer or a diva? Shop now. FREE SHIPPING ON $25 ORDERS – LAST MINUTE EASTER GOODIES! Great gift ideas from Zoya, Leila Lou, Kala Soaps and more! Free shipping on any $25 order for one day only! Beauty of a Site has some great new products that are fun for Spring and perfect for last minute Easter Basket treats! We wanted to start your Easter off right by offering a one day only online coupon for FREE SHIPPING on any $25 order (subtotal)! Hurry before this opportunity bounces away, just like that Easter Bunny! All orders have the option of being expedited (additional shipping charges apply) to receive your package by Easter! Don’t wait! Make this holiday extra special! Zoya True Collection, New for Spring 2012! Fashion thought! It can be somewhat time-consuming to have to change your nail color with each outfit! However, these neutral creamy shades can go with almost any Spring wardrobe! Less hassle, more fashion please!